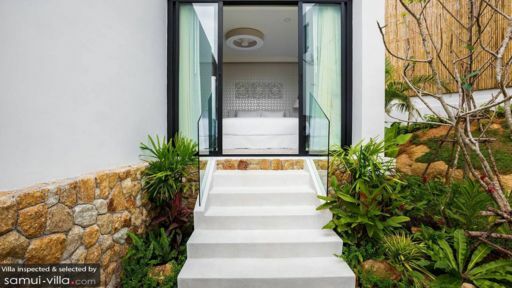 Found in the middle of the most beautiful landscape that Samui has to offer, Villa Narak on Choeng Mon beach is a luxurious, ocean-facing, two-bedroom home that is more like a hotel but with all the comforts of a private villa. With an infinity view spanning luscious flora and the turquoise ocean beyond, the villa is the perfect escape from busy lives to take a breather amidst natural surroundings. 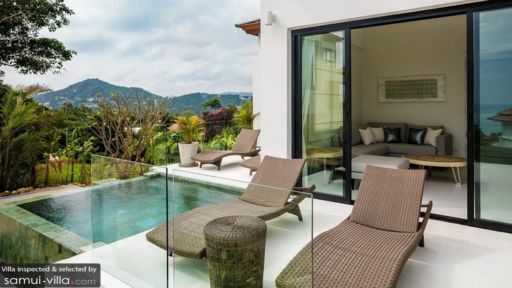 Equipped with modern amenities to make you feel right at home, the villa provides comfortable spaces, air-conditioned interiors and easy movement outdoors. Spend your holiday relaxing by the pool with your friends and family with nothing to disturb your peace. Two, luxurious bedrooms are available at Villa Narak that are not only well-furnished but elegant in their interiors. Air-conditioned and fitted with TVs, the bedrooms are modern enough to make you comfortable. While the master room is furnished with a king-sized bed, the second bedroom has twin beds that are great if you have children accompanying you. Each bedroom is accompanied by an ensuite bathroom with all modern facilities to make your stay even more convenient. Nestled amidst the verdure of tropical flora, the swimming pool features a natural-tiled floor and refreshingly-cool water to wake up in the morning with an early dip. The infinity pool is where you can enjoy unmatched views of the Choeng Mon shores and dazzling waters of the ocean. The poolside deck is equipped with four, rattan sun chairs that are suitable for sunbathing and even taking an indulgent nap without a care in the world. 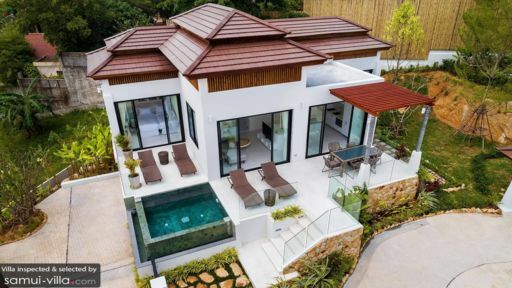 Located right next to the swimming pool, separated only by the sliding glass doors, the living area at Villa Narak is modern and contemporary with minimal décor, soothing colours and unique furnishings such as the wooden-log coffee table. The natural grey sectional is great for when you wish to kick back with a glass of wine and enjoy watching your favourite movie or TV show on the flat-screen TV. The living space is air-conditioned so you can be comfortable even during the hotter hours of the day. Move around with ease and you can even entertain guests around the pool since everything is well-connected. There is a dining area located right outside on the sundeck with a beautiful, glass-top dining table for six guests. Steps leading down to the gardens make this the most charming spot for a meal while the kids can easily play outdoors. A spacious, fully-equipped kitchen is found in a separate room adjacent to the living area and accessible from the pool deck complete with a marble-top breakfast bar and high stools for a quick bite or drink in the evening. Villa Narak extends five-star services to its guests including housekeeping services, 24-hour security, garden/pool maintenance and others. There is a provision for additional guests but at an extra cost. Some of the services are available upon request only such as airport transfers, car rentals, laundry and massages to truly experience Thailand. You even get a complimentary breakfast as part of your stay. The villa is part of Horizon Estate, so the guests have an advantage of accessing the facilities offered by the estate as well. Please enquire before booking. Minutes away from the beautiful and glistening shores of Choeng Mon Beach, Villa Narak is completely immersed in paradise surrounded by the most luscious part of Samui. There are so many interesting things to do in the area such as visiting the Big Buddha Bophut for amazing photographs, dining beachside for gorgeous sunsets and making your way across cafes teeming with families.